Month over month July and August data was actually quite positive. Jobs were up, the unemployment rate was down, average hours worked and average hourly pay were up. Vehicle sales made a new nearly 6 year high and returned to their pre-recession normal range. 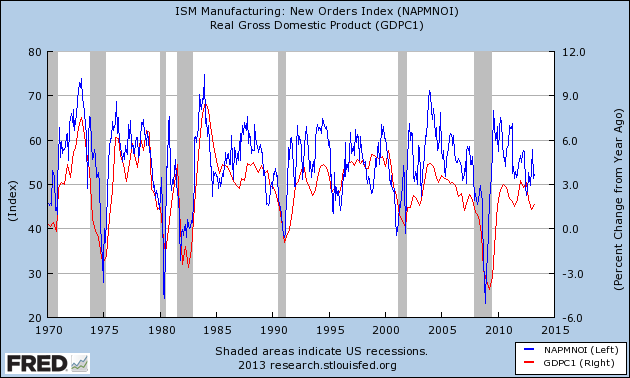 Both the manufacturing and services ISM indexes were positive and improved. Construction spending for all sectors except public construction was up. Productivity was up. Unit labor costs were unchanged. Only factory orders were negative, as were the significant downward revisions to the June and July jobs reports, and the fact that a significant increase in people simply left the labor market. 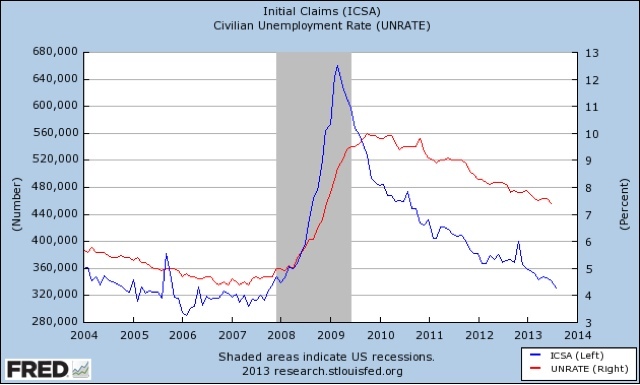 Initial claims remain firmly in a normal expansionary mode. Like each of the last three years that this same, a good, downside breakout has occurred. Temporary staffing had been flat to negative YoY for a few months, but has now also broken out positively. Tax withholding, on the other hand, had a relatively poor August. Steel production over the last several years has been, and appears to still be, in a decelerating uptrend. Obviously there is some noise in the weekly numbers. It has been negative YoY for the last 3 weeks, and year to date, is running -4.0% YoY. The impact of what I suspect was simply a bad sample group at Gallup appears to have receded. Its 14 day average of consumer spending is once again very positive. The ICSC varied between +1.5% and +4.5% YoY in 2012, while Johnson Redbook was generally below +3%. The ICSC has been weakening and this week was even weaker, but Johnson Redbook remains at the high end of its range, and has actually been improving. The price of Oil hit a new 2 year high. The 4 week average for gas usage was negative, for the first time after eight straight weeks of being up YoY. Interest rates for corporate bonds had been falling since being just above 6% in January 2011, hitting a low of 4.46% in November 2012. Treasuries fell to a possible once-in-a-lifetime low of 1.47% in July 2012, and have decisively risen more than 1% above that mark. Spreads, however, made a new 2 year low this week. Their recent high was over 3.4% in June 2011. Refinancing applications have decreased sharply in the last 4 months due to higher interest rates, declining by more than 50% in total, and are now just about as bad as they have been at any point in the last 7 years. Purchase applications have also declined from their multiyear highs in April, but are still slightly up YoY. Rail transport had been both positive and negative YoY during midyear, but this week was the fourth positive week in a row since then, and the most positive showing in a long time. The Harpex index had been improving slowly from its January 1 low of 352, but then flattened out for 9 weeks before making a new 52 week high several weeks ago. The Baltic Dry Index has rebounded to make yet another 18 month high. In the larger picture, both the Baltic Dry Index and the Harpex declined sharply since the onset of the recession, and have been in a range near their bottom for about 2 years, but stopped falling earlier this year, and now seem to be in an uptrend. The TED spread is still near the low end of its 3 year range, although it has risen slightly in the last couple of months. LIBOR established yet another new 3 year low intraweek at 0.180%. It helps to visualize the economy as moving like a snake or congested rush hour traffic. Different sections are stopped, or are moving forward, or are shifting directions, simultaneously, but all together create a coordinated movement. Similarly, in looking at the economy, the forward-most section is the long leading indicators, followed by the short leading indicators, followed by the coincident indicators, followed by the lagging indicators. The long leading indicators look, frankly, like they want to roll over. Interest rates are negative, housing is turning negative, money supply is decelerating, and I suspect that despite their stellar Q2, corporate profits are decelerating as well. Meanwhile the shorter leading indicators of initial jobless claims, vehicle sales, interest rate spreads, and the ISM manufacturing indexes all look positive, as does the ISM manufacturing index, although, contrarily, factory orders are negative. Temporary employment is up. The manufacturing workweek improved. Construction is positive. Stocks are neutral, however, and the choke collar of higher oil prices has engaged. Commodities as a whole have turned neutral. The coincident indicators hit a soft patch, but some of these too look like they might break out positively. Rail traffic, which had been a real concern, has broken to the upside, as has shipping. Consumer spending is holding up well. Bank lending rates are at or near their lows. On the other hand, tax withholding is near its lows for the year. Steel production is negative. Finally, the important lagging indicator of the unemployment rate is declining, but not for a good reason this month. Putting the picture together, the economy may have nearly stalled in the last few months, but looks like it is ready to pick up steam again for the rest of the year, Washington willing. As we look further forward into 2014, much more caution is warranted. It's been a great week here at the Bonddad Blog, as we've gotten links from Abnormal Returns, Counterparties, FT Alphaville and Kevin Drum. For those of you who are new to this blog, I take the weekend off while New Deal Democrat (NDD) puts up is weekly "high frequency indicators" on Saturday (or Sunday). I'll be back early Monday AM with a look at this week's US economic numbers and market action. Until then, don't think about the markets or the economy. The trend that has had me the most worried since even before the onset of the 2008-09 severe recession has been the likelihood that households would run out of room to refinance debt at lower interest rates even as their wages languished. The blue line in the graph above is real, inflation-adjusted YoY wages through July (August's CPI hasn't been reported yet, but is likely to be between unchanged and +0.2%, so real YoY average wage growth is going to be improved). The red line is nominal average wages. I've included both because, with the exception of the 1990 recession, both peaked and turned down prior to the onset of recessions. Additionally, real average wages turned negative in each of those cases. Once August inflation is reported, I expect that number to be the most positive since 2010. Obviously this is just one statistic, the time series is limited, and it isn't infallible, but it confirms that the economy is still expanding, and it does indicate that the lot of the average worker has begun to improve. The headline for August 2013 employment is that 169,000 jobs were added, and the unemployment rate declined to 7.3%, a new post-recession low and in line with my examination of initial jobless claims yesterday - but keep in mind that the unemployment rate is a lagging indicator. While there were many positives, mainly they simply took back declines from last month. June and July were both revised down, the second month in a row of negative revisions. Negative revisions are not a good sign. We also had a negative number from the very volatile household report, which often turns first. First, let's look at the more leading numbers in the report which tell us about where the economy is likely to be a few months from now. These were positive or neutral. the average manufacturing workweek increased 0.1 hours from 40.7 hours to 40.8 hours, but is still below where it was 2 months ago. This is one of the 10 components of the LEI and will affect that number positively. manufacturing jobs rose for the for the second month in a row, after 4 months of decline, up 14,000.
temporary jobs - a leading indicator for jobs overall - increased by 13,100.
the number of people unemployed for 5 weeks or less - a better leading indicator than initial jobless claims - was unchanged, and remains about 125,000 off its lows. 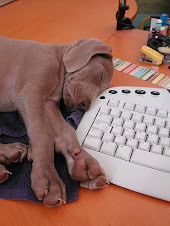 The average workweek for all workers increased 0.1 to 33.7 hours. Overtime hours increased 0.2 to 3.4 hours, which simply reversed last month's decline. the index of aggregate hours worked in the economy increased 0.4 hours from last month's level of 98.4 to 98.8. This is also a post-recession record. The broad U-6 unemployment rate, that includes discouraged workers declined from 14.0% to 13.7%, also a new post-recession low. The workforce declined 37,000. Part time jobs fell by -334,000. I predict there will be silence from all those Doomers whose metric of part-time jobs since the beginning of this year looks shot to hell. 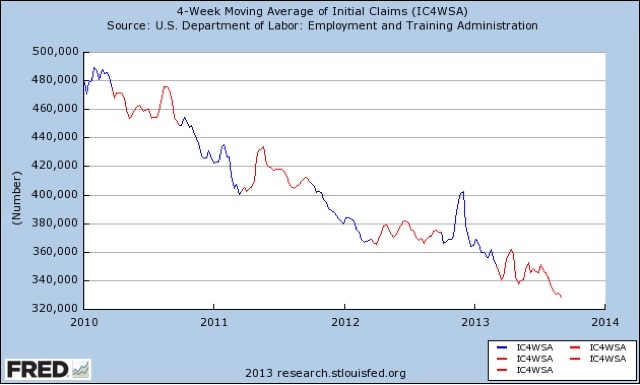 the alternate jobs number contained in the more volatile household survey actually decreased by -115,000 jobs. Government jobs actually increased by 17,000. Combined revisions to the June and July reports totalled a loss of -74,000 jobs, with the reports now showing +172,000 and +104,000 jobs, respectively. Downward revisions are not a good sign, although this is only one month. average hourly earnings increased from $23.98 to $24.05. The YoY change increased from +1.9% to +2.2%, meaning that YoY average real wages have increased again. This was a positive report, and the leading parts of the report were either positive or neutral. That's all good. That aggregate hours increased strongly is probably the best single item in the report. That part time jobs declined substantially means the Doomers will have to find something else to hang their hats on (and, memo to Mish, in a showdown between initial jobless claims and Gallup, go with initial jobless claims). But after industrial production and retail sales stalling last month, I really don't like the continuing downward revisions to past employment reports. And of course there is nothing to like in the continued flatness of the employment to population ratio. With the recent marked deceleration in the economy as shown by the last three quarters of GDP reports, with the long leading indicators of interest rates and housing turning negative, the ongoing Sequester that was so awful that it was never supposed to happen, and the approaching debt ceiling debate in Congress, this report, while positive for now, and consistent with continued expansion for the rest of this year, maintains the hoisting of a yellow flag for 2014. The recovery in the eurozone manufacturing sector entered its second month during August. At 51.4, up from a flash reading of 51.3, the seasonally adjusted Markit Eurozone Manufacturing PMI® rose for the fourth successive month to reach its highest level since June 2011. National PMIs improved in all nations bar France, while France and Greece were the only countries to register readings below the 50.0 no-change mark. 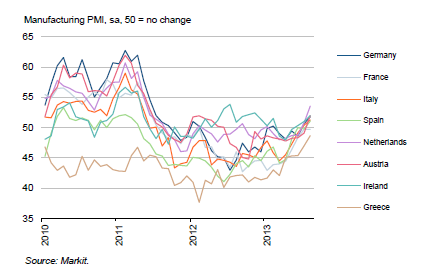 The Netherlands topped the PMI league table, followed by Austria and then Ireland. Growth rates for production, new orders and new export business all accelerated to the fastest since May 2011, with back-to-back increases also signalled for each of these variables. Meanwhile, the outlook for output remained on the upside as the new orders-to-inventory ratio hit a 28-month high and backlogs of work rose marginally. With the exception of France and Greece, all of the above numbers are showing an expansion. Note that all of the respective indexes are rising (some very strongly). 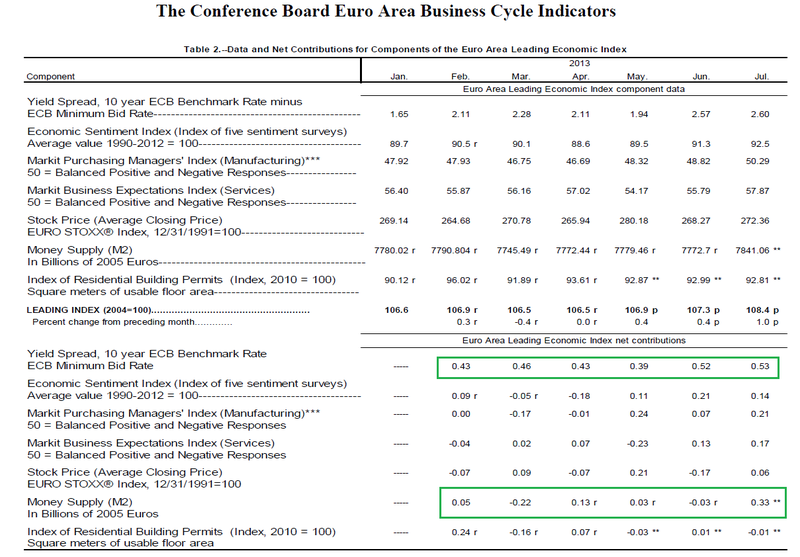 While we're here, let's take a look at the EU Leading and Coincident Indicators. 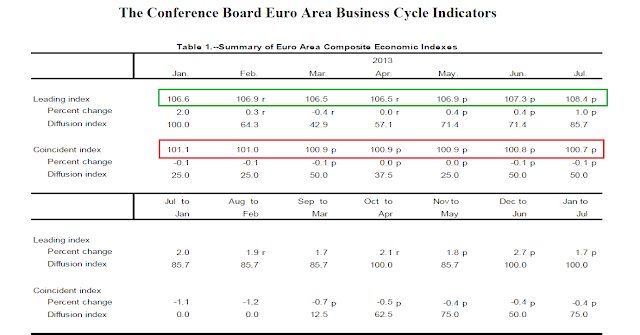 First note that the leading indicators (in green) are increasing while the coincident indicators (in red) are decreasing. However, the second table shows that the rate of decline in the coincident numbers is declining while the rate of increase in the leading indicators is staying fairly steady. The reason for the continued strong increase in the leading indicators is their large monetary component. Yield spread accounts for 20% while money supply accounts for 37% of the total index. At the same time, the number of employees accounts for 74% of the coincident indicators, which explains their weak performance. 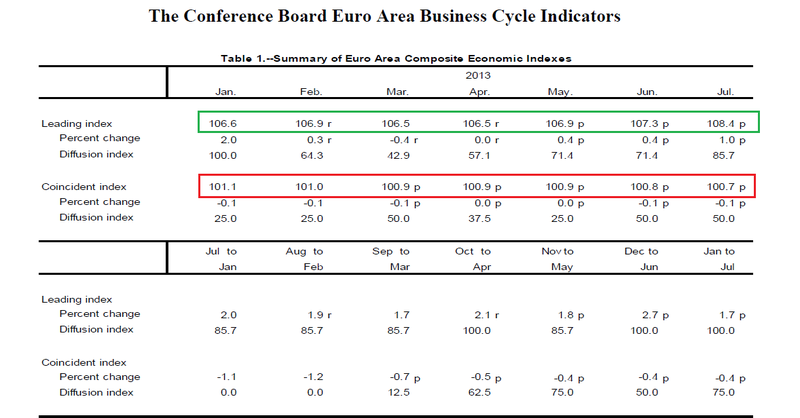 The weekly chart shows the euro follows the ISM readings in a general way. As the ISM numbers declined in 2011 so did the euro, falling (from peak to trough) from 148 to 119, or a decline of about 19%. Since hitting the low, the euro has rebounded, rallying to the 50% Fib retracement of the 2Q11-3Q12 sell-off. The mid 125's are now offering general technical support. With yesterday's report that August vehicle sales totalled 16.1 million on an annualized basis, we have finally returned to a normal, expansionary range. 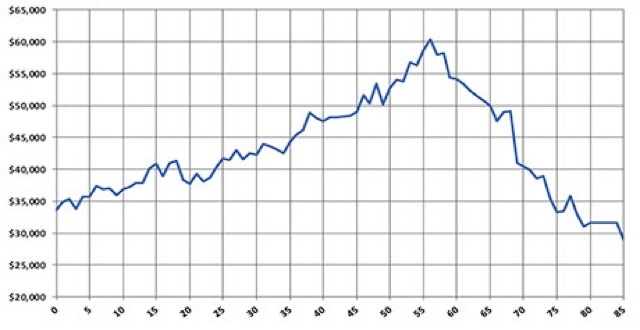 Before 1998, with the exception of a few months in the late 1980's, vehicle sales never crossed the 16 million mark. From then until the end of 2007, the normal range was 16 to 18 million. We have now finally returned to that range. This is true of more and more aspects of the economy as a whole - GDP, sales, income, and initial jobless claims are already there. Industrial production (slightly) and more importantly jobs and wage growth continue to lag behind. 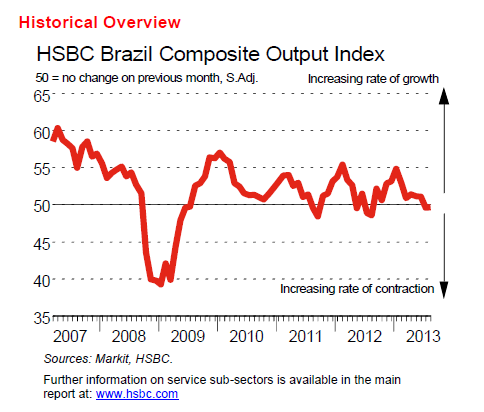 Brazil Prints Stronger Than Expected GDP Number; Is New Growth Around the Corner? While Brazil was once the darling of the investment community for its fast rates of growth, it has struggled over the least few quarters. There are several reasons for this slowdown, with the largest fact the slowdown in China's growth. As China's raw material consumption has dropped, exporters such as Brazil have seen trade revenue fall. In addition, Brazil has structural issues such as weak domestic infrastructure investment, a wide income stratification and a difficult to navigate political system. In the comparison with the first quarter of 2013, the GDP (Gross Domestic Product) at market prices in the second quarter grew 1.5% in the seasonally adjusted series. The highlight was agriculture (growth of 3.9% in volume of value added), followed by industry (2.0%) and services (0.8%). In the comparison with the second quarter of 2012, the GDP grew 3.3%. The highlight was also agriculture (13.0%), followed by industry (2.8%) and services (2.4%). In the cumulative index in the four quarters ended in the second quarter of 2013 (12 months), the growth was of 1.9% over the immediately previous four quarters. In the first semester, the GDP expanded 2.6% against the same period of 2012. The GDP at current values reached R$ 1.2 trillion in the second quarter. Brazil’s economy expanded more than forecast by all analysts in the second quarter, as government stimulus propped up investment and a weaker real boosted the outlook for manufacturing. Gross domestic product expanded 1.5 percent during the April to June period, or an annualized 6 percent, the national statistics agency said today. That was the most since the first quarter of 2010 and more than all 44 forecasts from analysts surveyed by Bloomberg, whose median estimate was 0.9 percent. GDP expanded 3.3 percent from the same quarter last year. Today’s GDP data beat analysts’ median forecast for the first time since the last quarter of 2011. Investment, which declined last year as Brazil expanded at a quarter of the 3.5 percent pace of the global economy, continued to recover, jumping 3.6 percent in the second quarter. Despite the rebound, Brazil still has one of the lowest investment rates of major emerging markets at 18.6 percent of GDP. August’s seasonally adjusted HSBC Brazil Purchasing Managers’ Index™ (PMI™) rose from 48.5 in July to 49.4, indicating a further, albeit slower, deterioration of operating conditions across the country. 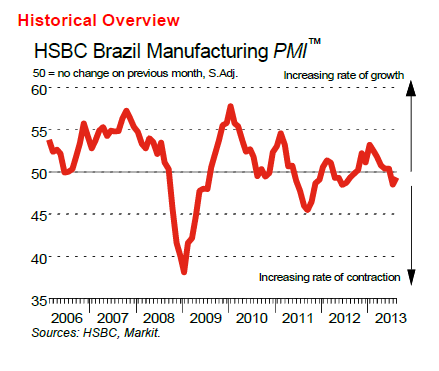 Output in the Brazilian manufacturing sector fell for the second successive month in August, amid evidence of lower volumes of incoming new work. That said, the rate of contraction eased to a marginal pace. Decreases were recorded in both the investment and intermediate goods sectors, while consumer goods producers continued to signal growth. Lower levels of new orders have now been recorded for two consecutive months, with the latest survey pointing to a marginal and slower pace of contraction. Those panel members indicating falling volumes of incoming new work reasoned that this was due to weaker demand and increased competition from Chinese manufacturers. Order book volumes fell at both intermediate and capital goods producers, while manufacturers of consumer goods signalled growth. Export business fell again in August, in part reflecting weaker demand from Argentinian and European clients. 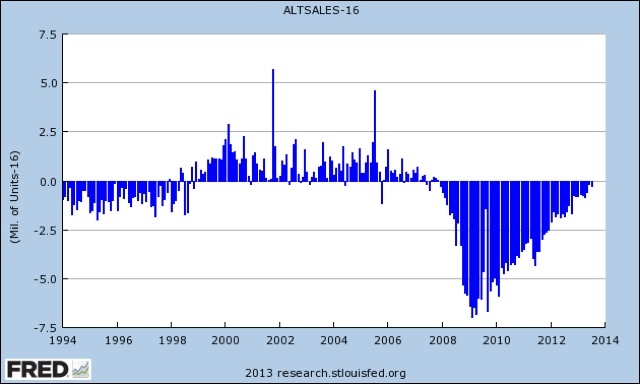 Meanwhile, purchasing activity contracted slightly in August. economic conditions and subdued underlying demand. August’s seasonally adjusted Services Business Activity Index dipped below the 50.0 no-change level for the first time in 12 months. Down from 50.3 in July to 49.7, the latest index reading was consistent with a marginal contraction of output levels across the country’s service sector. Among the six monitored sub-sectors, Post & Telecommunication registered the sharpest decline. There are three key points to make about the Brazilian ETF. 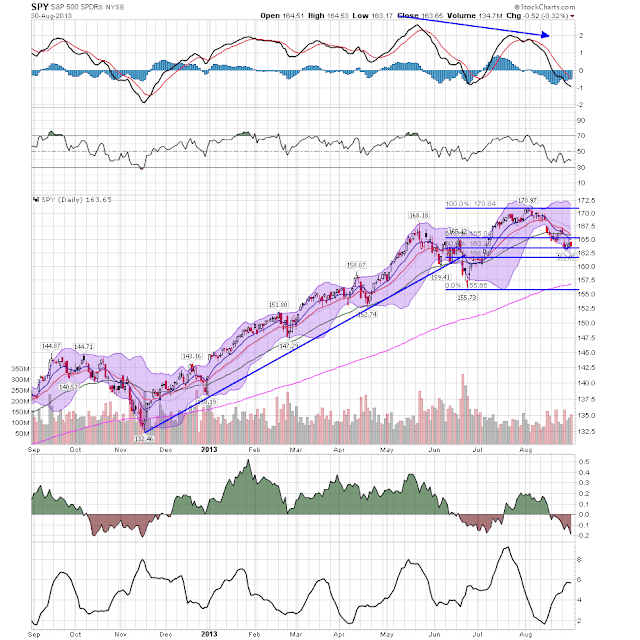 First, over the last year we see declining momentum, as evidenced by the continually lower peaks in the MACD. Secondly, prices broke long-term technical support between 47 and 48 in June. Third, prices are currently consolidating between the 41 and 45 price area. Because of the weak nature of this recovery, there is ample statistical ammunition for both the bullish and bearish economists to make their case. The bears can point to overall consistently weak GDP growth, still high unemployment and weak wage growth. In contrast, the bulls can point to strong auto purchases, rising home sales, an accommodating Fed and strong stock market. Neither side has sufficient data on their side to rhetorically put the other side away, as it were. Working age population growth is the lifeblood of any economy. The influx of new, working age people means they will have to find a job (or start a business) to support themselves. So long as the economy remains open and accommodating (which it will despite the overheated political rhetoric there is a very strong chance the economy will continue growing. The signs of resilience are everywhere: Households continue to spend. Businesses are investing and hiring. Home sales are rebounding, and the automobile industry is surging. Banks have healthier balance sheets, and credit is easing. All this coincides with the economy shedding the excesses of the past, such as unmanageable levels of consumer and corporate debt. Both Calculated Risk and Bloomberg point to to very key development: the cleaning up of our respective balance sheets. What started this recession was a massive build-up of debt in the system, largely related to the housing bubble. When the bubble burst, people had to sell the asset(s) underlying their debt, usually at a loss. As this process continued for a few years, people had to either declare bankruptcy and/or pay off their debt from existing earnings. This meant they had less money to spend on other items, meaning there was overall less economic demand, culminating in weak overall growth. 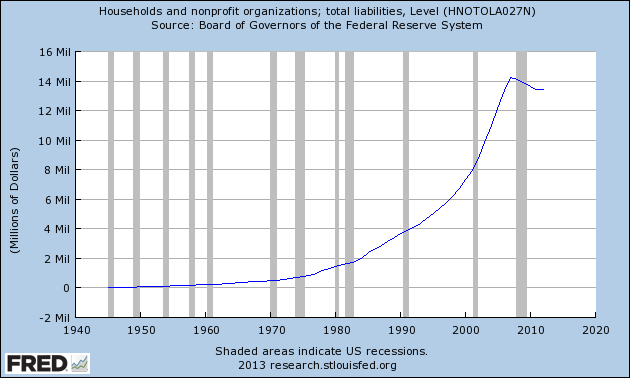 Total household and non-profit debt, according to the Federal Reserve's Flow of Funds report, has been dropping since a little bit before the recession began. 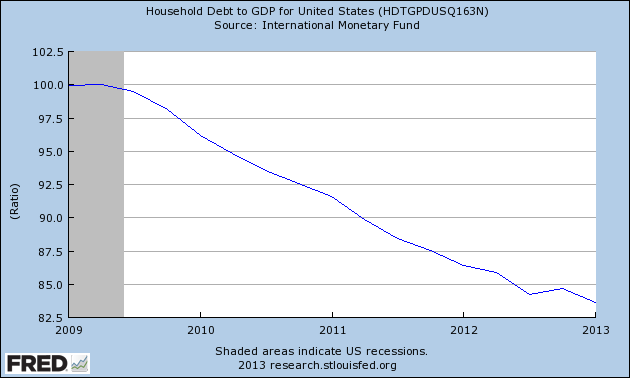 The IMF provided the data for this chart, which shows that total household debt has been declining as a percentage of GDP since mid-way through the last recession. 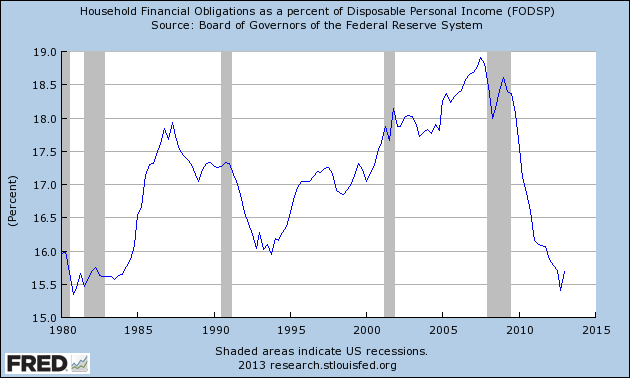 And finally, household obligations as a percent of disposable personal income are at very low historical levels. Rising noninterest income and falling loan loss expenses continued to lift bank earnings in the second quarter. FDIC-insured institutions reported net income of $42.2 billion, an increase of $7.8 billion (22.6 percent) compared with second quarter 2012 when industry earnings were reduced by losses on credit derivatives. This is the 16th consecutive quarter that earnings have registered a year-over-year increase. For a second consecutive quarter, industry earnings reached a new nominal high. However, the quarterly return on assets (ROA) of 1.17 percent, while up from 0.99 percent a year ago, remained below the 1.27 percent average for the industry from 2000 through 2006. More than half of all banks—53.8 percent—reported higher quarterly net income than a year ago, and only 8.2 percent reported negative net income. This is the lowest proportion of unprofitable institutions since third quarter 2006. Net loan and lease charge-offs totaled $14.2 billion, a $6.3 billion (30.7 percent) year-over-year decline. This is the smallest quarterly total since third quarter 2007. While charge-offs were down across all major loan categories, the overall decline was led by residential real estate loans. Charge-offs of home equity lines of credit were $1.1 billion (41.7 percent) below the level of a year ago, while charge-offs of other loans secured by 1-to-4 family residential properties were $1.4 billion (32.1 percent) lower. Smaller reductions occurred in charge-offs of real estate construction and land loans (down $772 million, or 67 percent), real estate loans secured by nonfarm nonresidential properties (down $775 million, or 52.5 percent), commercial and industrial loans (down $760 million, or 37.3 percent), and credit cards (down $748 million, or 11 percent). Noncurrent loan levels also showed improvement across all major loan categories. The amount of loans and leases that were 90 days or more past due or in nonaccrual status fell by $21.7 billion (8.3 percent) during the second quarter, marking the 13th consecutive quarter that noncurrent balances have declined. Noncurrent first lien mortgage loans declined by $13.3 billion (8.2 percent), while noncurrent real estate construction and land loans dropped by $2.8 billion (19.1 percent), and noncurrent real estate loans secured by nonfarm nonresidential properties fell by $2.5 billion (8.8 percent). During the quarter, the percentage of total loans and leases that were noncurrent declined from 3.41 percent to 3.09 percent, the lowest level since fourth quarter 2008. 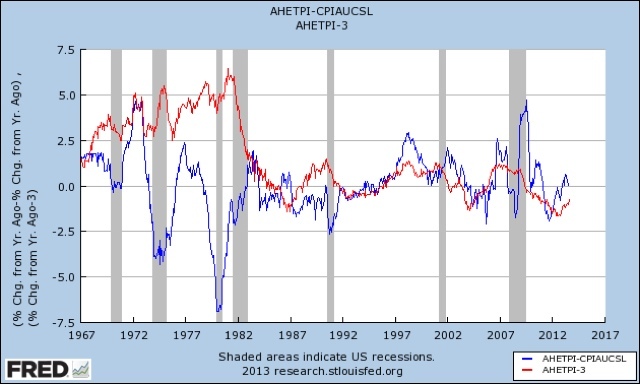 Put in economic terms, the above charts show the "balance sheet" recession is close to ending. Changes in demographics over the next two decades will make it even more difficult to raise the median, according to a Cornell economist. The most important contribution to declining income over the past decade, and particularly during the Great Recession and its aftermath, was the large number of unemployed men, they found. But looking ahead, they predicted that over the next two decades demographic shifts will be an important factor pulling the median down. In the 1990s and 2000s the Baby Boom generation, maturing into their peak earning years, helped to boost the median income. But as they retire over the next two decades their household incomes will fall sharply. Median household income is likely to continue to trend lower for the next 15 years, purely as a matter of demographics, as the Baby Boom generation retires. In order to get a better look at working-age households only, and do away with the effect of retirements, we need to look at median household income from ages 25-54 or 25-64. The Census Bureau does this calculation, but only on a yearly basis, and the most current statistics (at table H-10) are from 2011. The series should be updated for 2012 later this month. Yesterday, NDD noted that the strong ISM reading was a very good sign for the economy, going so far as to note, "This morning's unexpectedly strong ISM report appears to put to rest any worry about any imminent economic downturn." 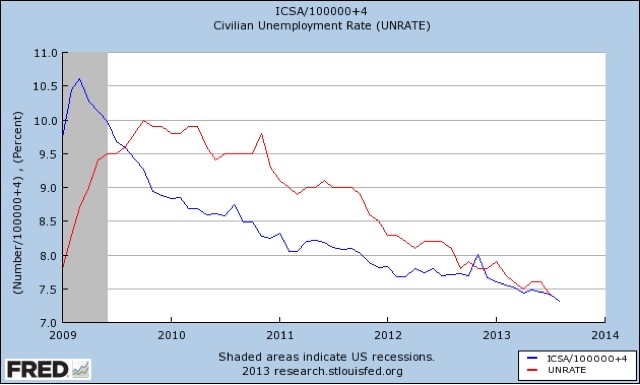 In correlation to his comments, consider the following two charts. 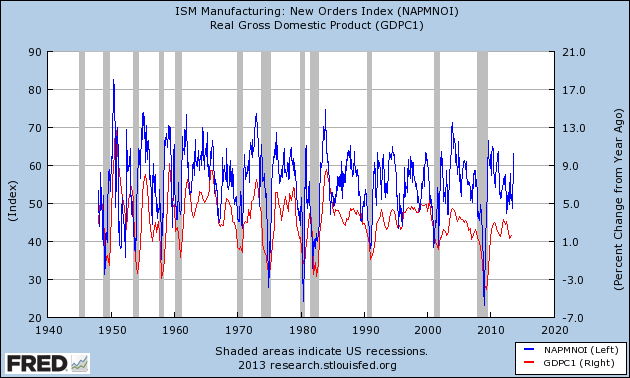 I've got the ISM new orders number (left scale in blue) and the year over year percentage change in GDP (right scale in red) on the chart above. While the correlation used to be a bit stronger (see the very tight relationship in the 1970s) there is still a good correlation between the numbers. The reason is actually pretty straight forward. When market participants think the economy will pick up, they order more things like equipment to produce goods and things to sell. Hence, the pick-up in new orders and its inclusion in the Conference Board's leading indicators series. 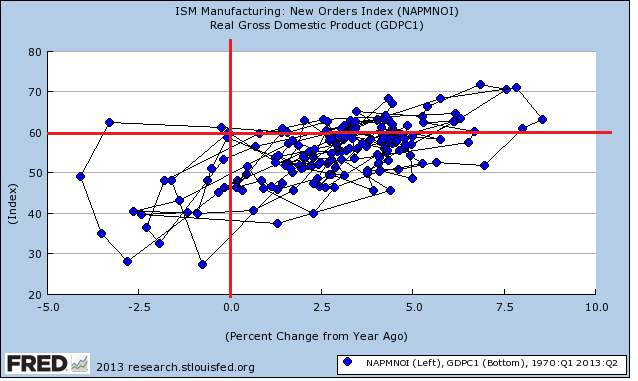 Above is a scatter plot of the ISM readings and the percentage change in GDP readings. I've had to convert the ISM readings to a quarterly number (using an average of the three months). This means the comparison is a bit weaker, but I believe it still makes the primary point: an ISM reading above 60 almost always correlates with positive year over year GDP growth. The yen dropped sharply after Abe announced that yen devaluation was part of this three part plan to return Japan to a period of growth. From peak to trough, the yen lost about 27%. 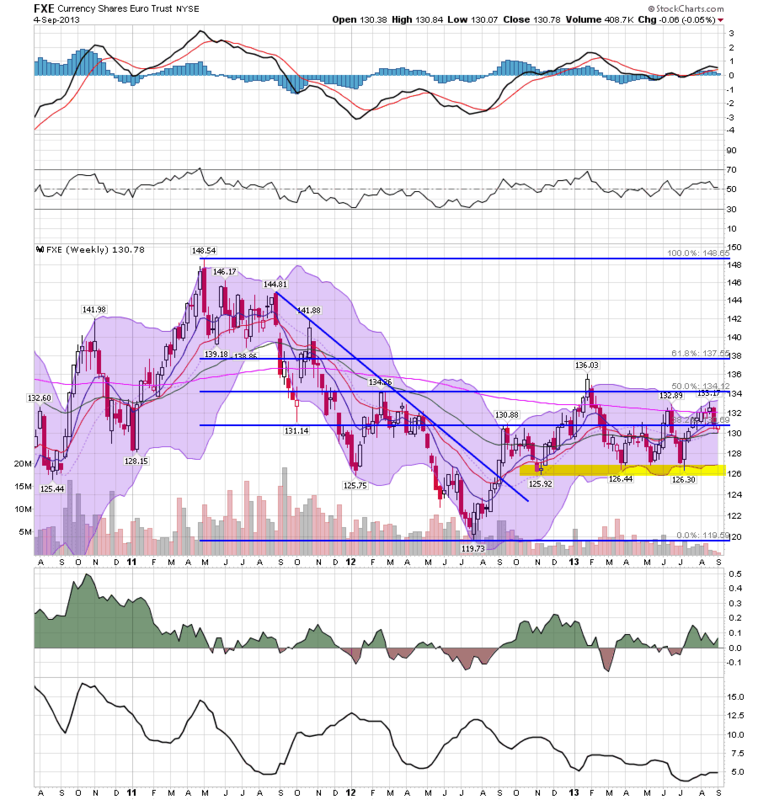 However, for the last few months the yen has been consolidating losses around the 38.2% Fib level of the 07-11 rally. The real test for Abe will come when the yen breaks this pattern. Ideally, we'd like to see prices trade sideways. This morning's unexpectedly strong ISM report appears to put to rest any worry about any imminent economic downturn. This morning's reading of 63.2 is the strongest in over 2 years. Only 28 months in the last 30 years (360 months) have been stronger. India’s economy slowed sharply in the three months to June piling further pressure on Prime Minister Manmohan Singh’s crisis-hit administration, as it struggles to find ways to support its plunging currency and reassure increasingly anxious foreign investors about its future growth. Asia’s third-largest economy expanded by just 4.4 per cent compared with the same period in the previous year, from 4.8 per cent in the preceding three months. The figure was well below expectations and its worst performance since 2009, raising fresh doubts about government assurances that growth would pick up again later this year. All see this from Bloomberg and Reuters. Indian prices are near their lowest level in over 1 1/2 years. Prices started dropping hard in early May, falling through the 200 day EMA. Since then, we've seen two attempted rallies that fell short. Prices moved through the 45-46 level (a key technical support area) earlier this month. 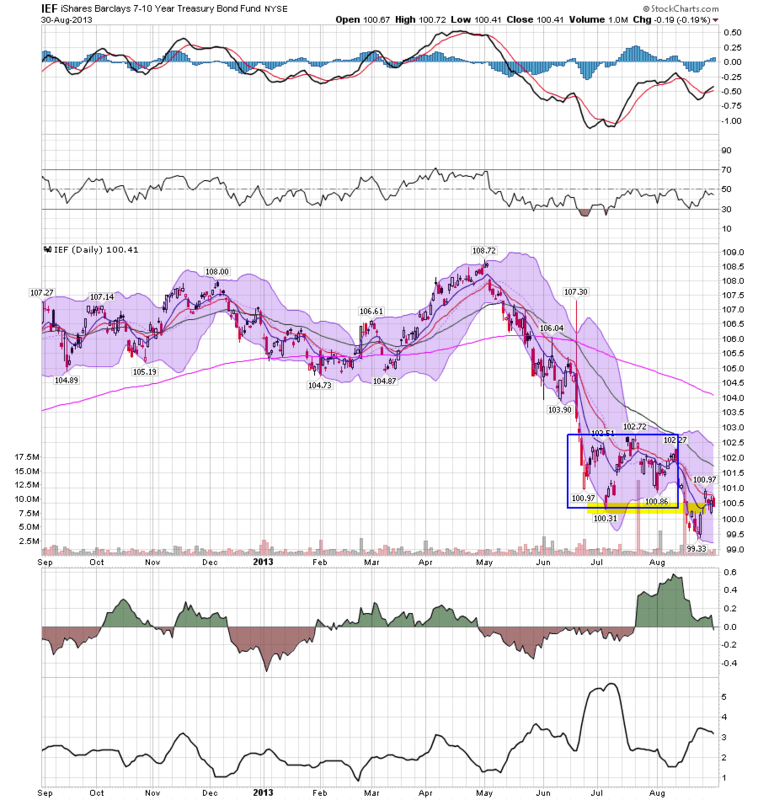 The underlying technicals for this chart are very bearish. Prices have dragged the shorter EMAs below the 200 day EMA, the MACD is negative and declining, the CMF is negative and volatility is increasing. Let's start by looking at last week's economic numbers. Texas manufacturing is still expanding, although at a slower rate. Production, new orders and shipments all printed lower numbers, although all are still positive. Data through June 2013, released today by S&P Dow Jones Indices for its S&P/Case-Shiller1 Home Price Indices, the leading measure of U.S. home prices, showed that prices continue to increase. The National Index grew 7.1% in the second quarter and 10.1% over the last four quarters. The 10-City and 20-City Composites posted returns of 2.2% for June and 11.9% and 12.1% over 12 months. These numbers indicate the housing recovery is still on track. However, I would expect this number to start slowing over the next 4-6 months. The latest readings are from the end of June, meaning they probably don't reflect the increase in interest rates that we've been seeing over the summer. The Richmond Fed's manufacturing number jumped sharply, rising 25 points to a reading of 14. This index has been stuck in the doldrums for a number of months, so this reading is very encouraging. The BEA revised the 2Q GDP up to 2.5%. This was by far the biggest and most important economic number released last week. While we would love for growth to be stronger, any upward revision is welcome. 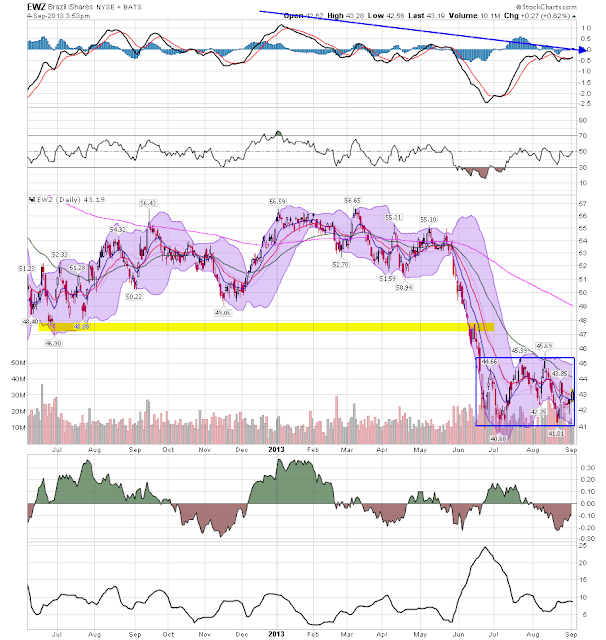 NDD and I covered this report here. The Chicago PMI increased to 53. 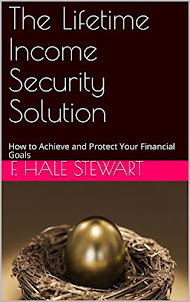 Personal income increased $14.1 billion, or 0.1 percent, and disposable personal income (DPI) increased $21.7 billion, or 0.2 percent, in July, according to the Bureau of Economic Analysis. Personal consumption expenditures (PCE) increased $16.3 billion, or 0.1 percent. In June, personal income increased $38.2 billion, or 0.3 percent, DPI increased $27.3 billion, or 0.2 percent, and PCE increased $64.0 billion, or 0.6 percent, based on revised estimates. Real DPI -- DPI adjusted to remove price changes -- increased 0.1 percent in July, in contrast to a decrease of 0.2 percent in June. Real PCE -- PCE adjusted to remove price changes -- increased less than 0.1 percent in July, compared with an increase of 0.2 percent in June. Purchases of durable goods increased 0.1 percent, compared with an increase of 0.9 percent. Purchases of nondurable goods increased 0.5 percent, compared with an increase of 0.1 percent. Purchases of services decreased 0.1 percent, in contrast to an increase of less than 0.1 percent. I'm placing the DPI and PCE numbers in the neutral category because of the very weak growth in these key metrics. While I'd expect weak wage growth in a period of 7%+ unemployment, it also means there is less money available for PCEs, which are vital for the economy to continue moving forward. U.S. consumer sentiment retreated in August from last month's six-year high, though Americans were slightly more upbeat in their outlook than earlier in the month, a survey released on Friday showed. The Thomson Reuters/University of Michigan's final reading on the overall index on consumer sentiment slipped to 82.1 in August from 85.1 in July. Durable goods orders dropped 7.3%, or .6% (-.6%) ex-transportation. Even though this was only one month's worth of data, this number was a bit concerning. The best news last week was the upward revision of 2Q GDP, which is always a welcome development. Housing is also still on track, although the Case Shiller composite was for readings through June, so I'd expect some weakness to start in the next 4-6 months. The manufacturing numbers were mixed, as three regional surveys printed positive numbers, but these are contrasted with a nasty durable goods orders print. Consumer readings were at best just barely positive, but that's been the case throughout this expansion. Both the 60 minute (top chart) and daily (bottom chart) charts of the SPYs show a very disciplined sell off. 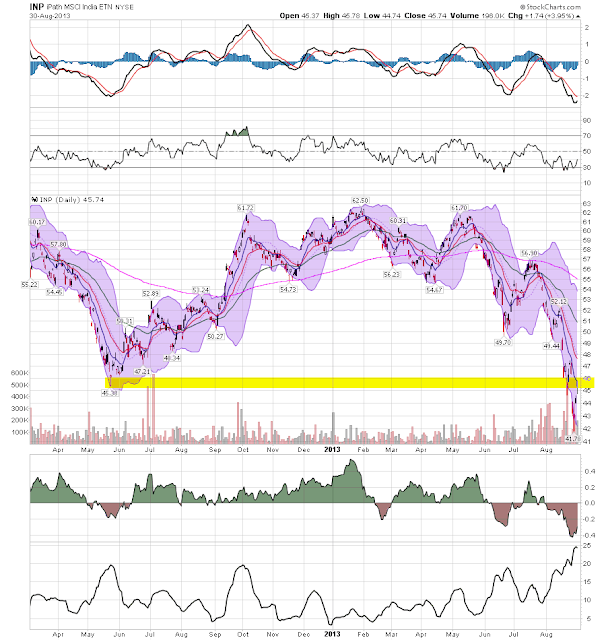 Two weeks ago, prices gapped lower but used the 61.8% Fib level for technical support. Last week, prices again gapped lower, this time using the 50% Fib level for technical support. 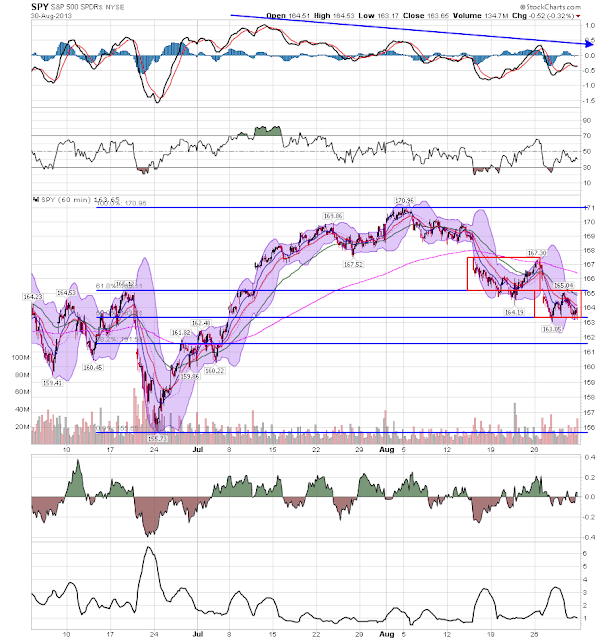 Both charts show declining momentum as well. Overall, prices have only dropped a little over 4%, so this is hardly a correction to be overly worried about (at least no yet). Also of importance on the daily chart is the fact the SPYs broke their upward trend in June, indicating that we are now trading in a sideways trading pattern. The treasury market consolidated between the 100 and 102. levels from late June to mid-August. After dropping through support, prices rallied back to resistance at 100. Overall, the chart is still negative with the shorter EMAs still in a negative orientation. In the rear view mirror, second quarter GDP was revised upward. Corporate profits hit a new record. July monthly data included personal income and spending, both up slightly and flat in real, inflation-adjusted terms. The savings rate was also unchanged. Chicago area manufacturing improved slightly. Home price increases accelerated. Consumer confidence increased in August, but the two reporting series conflicted as to whether expecations were improved or declining. Steel production over the last several years has been, and appears to still be, in a decelerating uptrend. Obviously there is some noise in the weekly numbers. It has been negative YoY for the last 3 weeks. Temporary staffing had been flat to negative YoY for a few months, but has now also broken out positively. Tax withholding is back within its normal range for most of this year, although towards the weak end. Gallup's 14 day average of consumer spending steadied this week after plummetting last week. The ICSC varied between +1.5% and +4.5% YoY in 2012, while Johnson Redbook was generally below +3%. The ICSC was weak, but Johnson Redbook remains at the high end of its range. The price of Oil retreated but remained near its 52 week high. The 4 week average for gas usage was, for the eighth week in a row after a long streak to the contrary, up YoY. Real M1 made a YoY high of about 20% in January 2012 and eased off thereafter. Earlier this year it increased again but this week made a new 2 year low (although it is still positive). Real M2 also made a YoY high of about 10.5% in January 2012. 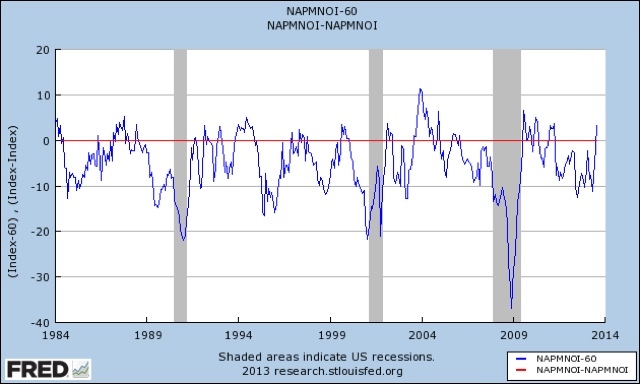 Its subsequent low was 4.5% in August 2012. It increased slightly in the first few months of this year and has generally stabilized since, although it has declined slightly in the past several months. Rail transport has been both positive and negative YoY in the last several months. This week was the third positive week in a row since then. The Harpex index had been improving slowly from its January 1 low of 352, but then flattened out for 9 weeks before tying its new 52 week high again this week. The Baltic Dry Index has rebounded to close to its recent 52 week high. In the larger picture, both the Baltic Dry Index and the Harpex declined sharply since the onset of the recession, and have been in a range near their bottom for about 2 years, but stopped falling earlier this year, and now seem to be in a slight uptrend. The TED spread is still near the low end of its 3 year range, although it has risen slightly in the last couple of months. LIBOR established yet another new 3 year low. The paradigm for the last several months remained intact this past week. Negatives included a further increase in interest rates, a decrease in mortgage refinancing, and the still elevated price of Oil. 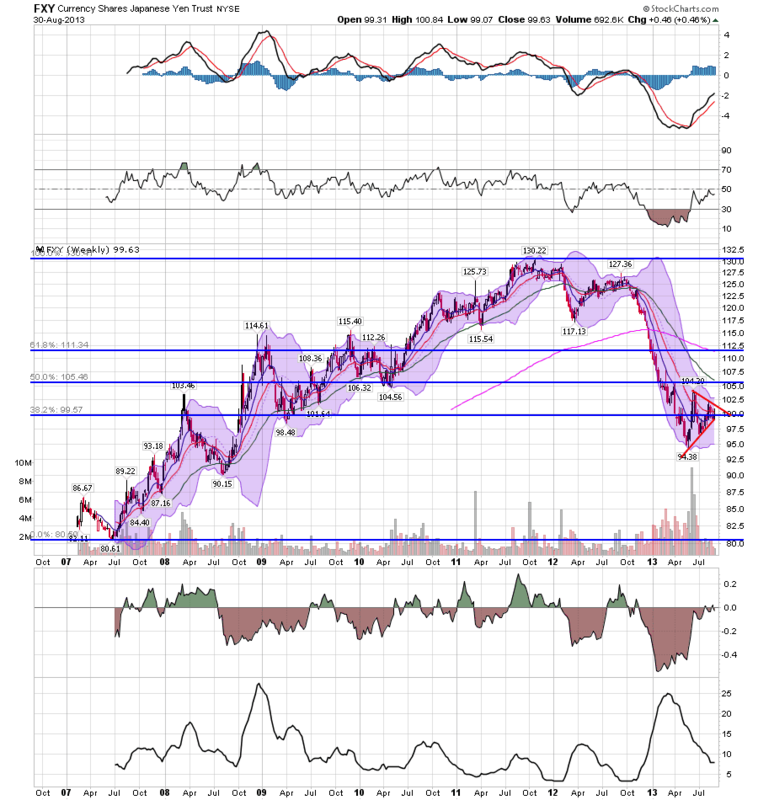 Steel production was also a negative, as were commodity prices. Purchase mortgages and real estate loans were slightly positive, as were tax withholding payments. Money supply also weakened a little bit, although it is still positive. Positives included consumer spending, temporary staffing, jobless claims, gas usage, bank rates, interest rate spreads, both rail and shipping transportation, and house prices. So the story remains that several of the long leading indicators - interest rates and housing - are problematic, while two others - corporate profits and money supply - are still trending up. Shorter leading indicators also remain generally positive. Have a nice long holiday weekend.